Get those skis and skates out and pack up the hockey sticks because the 2017 Toyota 4Runner is built to take you and your family to centre ice or anywhere the cold weather fun is this winter. With kids signed up for hockey practice and figure skating, you need a vehicle that can double as a cargo van and a passenger vehicle. 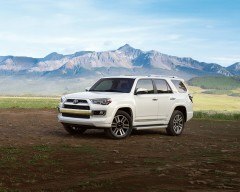 The 4Runner is that vehicle and so much more. This midsized SUV is built to transport five, but has an optional third row that brings the seating up to seven. The second row seats have the ability to recline up to 16 degrees, and when you need extra cargo space, a simple touch of a button folds them down. In the 7-passenger models, the rear seats are split-fold for versatility when transporting larger objects. There is a lot of floor room behind the seats, no matter which seat package you choose. There is 2,500 cubic litres behind the front seats, 1,300 behind the second row seats and 300 behind the third row seats. But it’s not just about hauling stuff. Toyota keeps you comfortable in their roomy, heated front seats. All of the models are equipped with SofTex simulated leather seating with the exception of the Limited edition, which offers true leather seating. While you may still be battling some snow and ice on the streets, the 4Runner is up to the challenge. All models are powered by a 4.0L V6 engine with dual variable valve timing with intelligence and come with one-touch 4wd. A 5-speed automatic transmission with overdrive is designed to get you through the toughest weather that Canada can throw at you. The TRD Pro model has been designed using the extreme off-road racing features developed by the Toyota Racing Development team. These features include things like automatic disconnecting differential, front skid plate, 4-wheel crawl control and multi-terrain select. You probably won’t need these great innovations just to take the kids to the hockey rink, but if you are ready to take on some extreme sports, they are handy to have on board. This is an SUV to reckon with. It has an aggressive front end that looks ready to devour the road or crash through a running stream of water. You have your choice of 17- or 20-inch tires, depending upon which model you choose. Active traction control picks and chooses where you need the most power. A hill start assist con trol lets you start on a steep hill without fear of rolling backwards into another parked car. The vehicle stability control keeps you upright and stable while travelling down the highway. This safety feature helps in the handling of the vehicle, so you have control at all times. In case you’re worried about the underside of the carriage while you’re trekking through rocky streams, Toyota put a fuel tank and transfer cover protector plate over these important parts. Trailer sway control helps you keep the weight evenly distributed, which helps you keep better control over the trailer and the 4Runner. The 2017 Toyota 4Runner is more than an SUV that takes kids and friends to hockey games; it is an adventure waiting to happen. There are several trim packages to choose from that add even more equipment to this SUV, and they are best seen in person. Come by and see us today for a tour around a Toyota 4Runner. It’s time for a test drive.